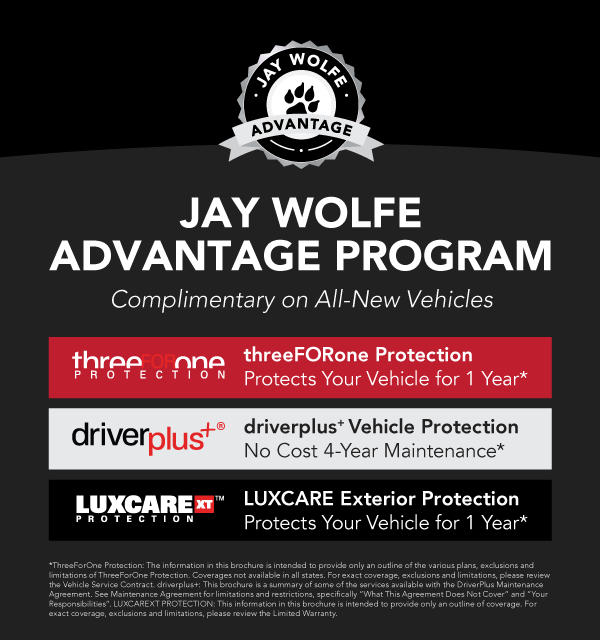 Complimentary on Every New Vehicle Purchase at Jay Wolfe Toyota of West County! Covers the repair, or if non-repairable, the replacement of a damaged tire(s) and/or wheel(s) caused by potholes or other road hazards. No limit on number of occurrences. Covers mounting, balancing, new valve stem and sales tax. Covers the repair of chips and cracks on your front windshield caused by propelled rocks or other road hazards. Repairs may be performed at the dealership, home or office. Repairs are performed by a professional technician. Repairing the windshield keeps original factory equipment intact. Permanent repair of dents and dings. Does not harm vehicle’s factory finish. Process developed by automotive manufacturers. For your convenience, ThreeForOne will cover up to $35.00 for a replacement vehicle for one day. Routine maintenance is an essential part of vehicle ownership because it helps to keep you driving in top condition. Make your servicer choice simple and be at ease knowing your vehicle is maintained by the dealer you trust, who will retain your vehicle service history records. Regular maintenance will help keep your vehicle dependable. Our multi-point inspection can alert you to potential safety concerns before they become a problem. Not only that, maintenance can also help satisfy requirements for any warranty on your vehicle. †ToyotaCare no cost maintenance covers the first 2 years or 25K miles whichever comes first. See participating Toyota dealer for plan details and exclusions. Valid only in the continental U.S. and Alaska. Maintenance beyond 2 years/25K miles is provided by Jay Wolfe Toyota of West County. The services include all regularly scheduled maintenance items at the scheduled maintenance intervals as outlined in your owner’s manual. 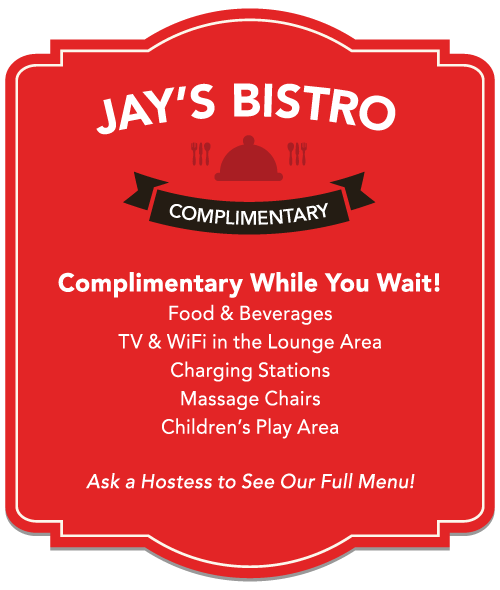 The maintenance is valid at any Jay Wolfe dealership and is non-transferrable. Exterior Painted Surfaces: Factory painted surfaces including body panels, spoilers, bumpers, trim areas, hinges, and side-view mirrors damaged by weather induced fading, chalking, or loss of gloss, acid rain, bird droppings, tree sap, industrial fallout, insect damage, permanent hard water etching, water spotting on chrome, Sun’s UV damage, de-icing agents and road salt, sand abrasion, accidental paint overspray, and oxidation. Headlight and Taillight Lenses: Treated headlight and taillight lenses against dulling, yellowing, and fading due to the UV damage from the sun. Alloy Wheels: Treated alloy wheels against excessive brake dust staining. Interior Carpet, Fabric, Leather & Vinyl Surfaces: Interior carpet, fabric, leather and vinyl surfaces including headliners, saddle leather, pigmented plastics, factory floor mats and factory trunk/cargo area carpets against permanent staining caused by fast food or beverage stains, dyes, inks, fading and discoloration, cracking of the dash, Sun’s UV rays, mold and mildew, chewing gum, crayons, lipstick and makeup, blood, urine and vomit, oil-based stains, loose seam stitching, and pet stains. Rips & Punctures Protection: Interior fabric, leather and vinyl surfaces coverage for rips and tears (up to one (1) inch in length), and punctures (up to one-fourth (1/4) of an inch in diameter). *ThreeForOne Protection: The information in this brochure is intended to provide only an outline of the various plans, exclusions and limitations of ThreeForOne Protection. Coverages not available in all states. For exact coverage, exclusions and limitations, please review the Vehicle Service Contract. driverplus+: This brochure is a summary of some of the services available with the DriverPlus Maintenance Agreement. See Maintenance Agreement for limitations and restrictions, specifically “What This Agreement Does Not Cover” and “Your Responsibilities”. LUXCAREXT PROTECTION: This information in this brochure is intended to provide only an outline of coverage. For exact coverage, exclusions and limitations, please review the Limited Warranty.